Leftovers if there are any. It's hit and miss how hungry we are, sometimes even if I plan for leftovers there are none. Mexican: Beans cooked that we soaked yesterday, cheddar cheese, guacamole, grain free crackers for us, organic corn chips from costco for hubby. Note: I have made a grain free cracker with coconut flour, but it's not great... so I'm not sharing the recipe yet. We like it fine, but it's just not that great, know what I mean? Eggs, muffins if I'm up. Just eggs if hubby lets me sleep and he's making breakfast. Something more fun, maybe homemade chicken nuggets with coconut flour as the breading. 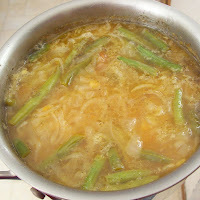 Cooked green beans with coconut oil, fresh juice. On the weekends I usually make enough 'lunch' for dinner too so it can all be cleaned up at once. Or we patch together a lunch to take with us if we go out and have an early dinner right after the kids wake up from their nap. Exercise and other things: We try to get fresh air every day, unless it's too cold. On snow days we shovel the sidewalk and play in the snow, on days when it's not too bad we walk. The jogging stroller surprisingly goes well over ice. Not so great on the snow though. We like to visit friends at least twice a week; on those days I don't do much blogging (I plan my blog posts out ahead, so I can still publish consistently) and I try to get my dinner at least started and the house picked up before I leave. We're all early risers, so it's not too much of a push to do this, we're more productive in the mornings anyway. 0 Response to "Sugar and Grain Free Menu Plan Jan 17th (GFCF, GAPS, SCD)"